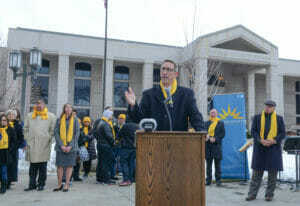 Hundreds of students, with parents and teachers, braved temperatures in the 20’s Wednesday morning to show their support for school choice, part of National School Choice Week, at the capital. January 25, 2017. Shelby Petersen talked about her charter school experience. Photo by Tim Dunn/Special to the Nevada Independent. Shelby Petersen said she used to be so shy that she had trouble ordering a burrito for herself for lunch, much less asking questions of her teachers at the crowded school she was zoned for through middle school. Petersen said that her whole self-image changed when she had a choice and opted for Alpine Academy Charter High School in Sparks, where she’s now in a dual-credit program that allows her to complete college courses while still in high school. Hundreds of students, with parents and teachers, braved temperatures in the 20’s Wednesday morning to show their support for school choice, part of National School Choice Week, at the capital. First-grader Ciara Richards. January 25, 2017. Photo by Tim Dunn/Special to the Nevada Independent. Wednesday’s rally at the Capitol complex, populated by busloads of students wearing matching bright yellow scarves, aimed to highlight a spectrum of school options like Petersen’s charter school and fight against what organizers described as a “one-size-fits-all” approach to public education. 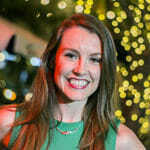 It also sought to drum up support for the most controversial option on the school choice spectrum — Nevada’s sweeping, voucher-style Education Savings Account program, which allows parents to claim more than $5,000 in state funds per child for qualified educational expenses such as private school tuition. Supporters are heartened that the Nevada Supreme Court recently declared the general framework of the state’s sweeping ESA program is constitutional, and that Republican Gov. Brian Sandoval proposed spending $60 million over the next two years to restart the program that’s stalled over its funding mechanism the justices struck down. But there’s already talk of hardball in the legislative session that begins Feb. 6 as Republicans, who are in the minority, try to push their beloved program past Democrats who are in control and have resisted ESAs in the past. 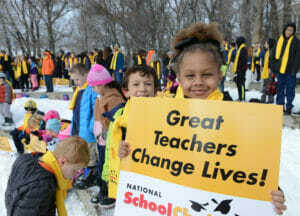 Hundreds of students, with parents and teachers, braved temperatures in the 20’s Wednesday morning to show their support for school choice, part of National School Choice Week, at the capital. Keynote speaker Nevada state Senator Scott Hammond. January 25, 2017. Photo by Tim Dunn/Special to the Nevada Independent. Groups that have sided against the ESA program in lawsuits and in the Legislature were quick to respond to the rally with criticisms that the program drains money from cash-strapped public schools and supports private schools that can reject applicants based on religion and other grounds. Nevada’s ESA program, considered the broadest program of its kind in the country, has attracted national attention and campaign spending from groups that hope to replicate it across the country. In addition to local organizations such as the Nevada Charter School Association and the conservative think tank Nevada Policy Research Institute, rally co-sponsors included the LIBRE Initiative, a group affiliated with the conservative billionaire Koch Brothers that seeks to promote free-market principles in the Hispanic community. Questions loom about how to pull it off. The Nevada Supreme Court ruling means lawmakers must make a conscious decision about how much money they’ll put toward the program, and practically speaking, that means the end of unlimited ESAs. Grant Hewitt of the Nevada Treasurer’s Office, which administers the program, said his office is still considering how to divide the potential $60 million among an applicant pool that’s larger than that — should ESAs be first-come, first-served? Should the office scrap existing applications and start over with a short application window? 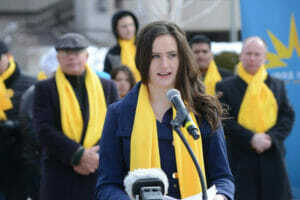 Hundreds of students, with parents and teachers, braved temperatures in the 20’s Wednesday morning to show their support for school choice, part of National School Choice Week, at the capital. 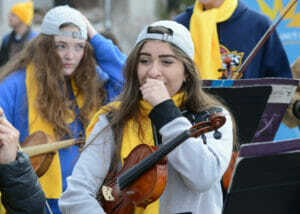 Nathaly (cq) Maldanado, a violinist with the Coral Academy, blows on her hands to warm up. January 25, 2017. Photo by Tim Dunn/Special to the Nevada Independent. Whatever the details, Republican lawmakers are staking out a position as champions of ESAs and the broader cause of school choice. They delivered speeches in the 16-degree chill, rallying parents and children during a spirited rally that also included a DJ, a mini concert from a charter school orchestra and dancing to Justin Timberlake’s “Can’t Stop the Feeling” — the official song of school choice week.